Alexander's McQueen's skull clutches are truly extraordinary. No one can balance edgy and elegant the way the McQueen line can. 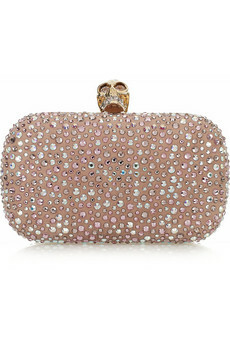 This classic skull diamante clutch is a perfect pastel addition to the collection. This amazing clutch has done something that I find personally amazing. It has combined three things that I don't really like (pastels, rhinestones, and satin) and made me totally love them. Each of these elements on its own is a little too girly or flashy for me, but put them together and they become a decadent delight. The classic shape of this box clutch is pure understated elegance. It subtly allows the strength of the materials to shine, and shine they do. The McQueen signature skull clasp is as embellished as the rest of the bag. It has rhinestones for both teeth and eyes, which is simultaneously kitschy and cool. This is the perfect accessory to add a little feminine toughness to your evening wear. Sure, it's pricey, but this kind of cool doesn't come cheap. And all-in-all, $2,195 isn't such a bad price to pay for it.